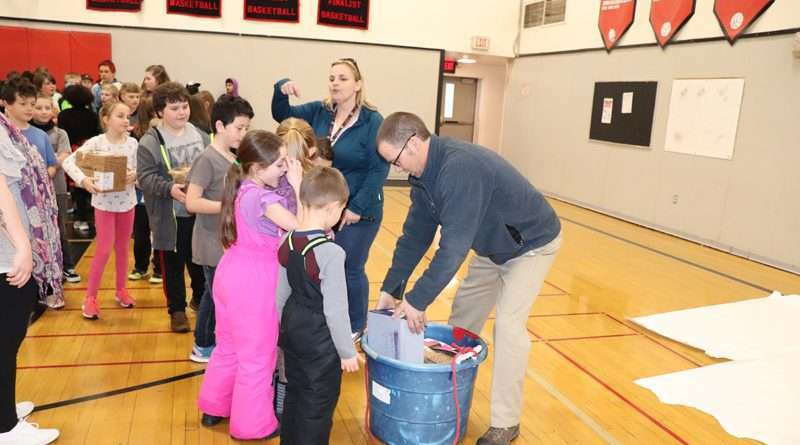 Children in kindergarten through eighth-grade, at Fletcher Walker Elementary, used a variety of products to package a raw chicken egg in a way that would prevent it from breaking when dropped from a tall height. Creativity was encouraged, with only a short list of prohibited items, which were wood, glue, bubble wrap and parachutes. The devices were dropped Tuesday, March 5, from the announcer’s booth in the Westwood High gymnasium by Jon Foy, a middle school teacher. 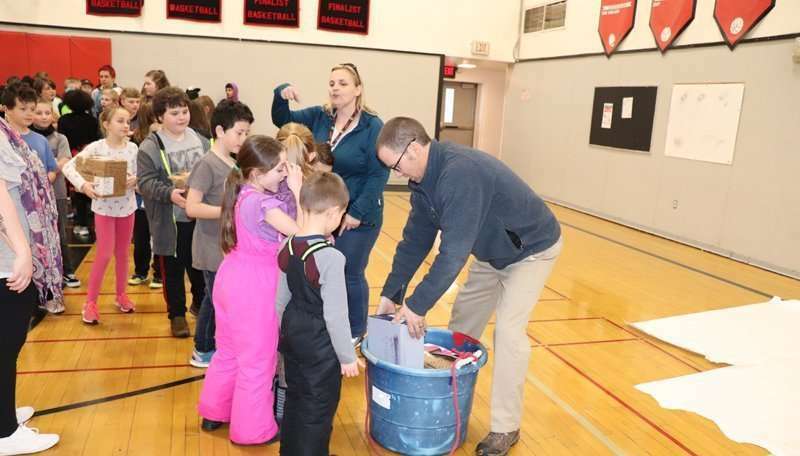 They were pulled up to the booth in a plastic tub tied to a rope, beginning with the entries from the primary grades and progressing to the junior high students. Carol Ross, a retired teacher who regularly substitutes, organized the challenge. 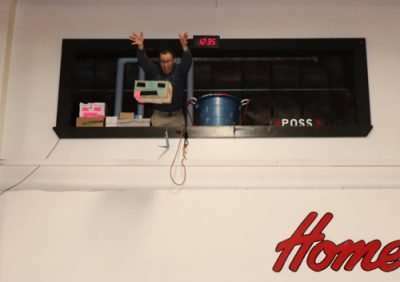 A device designed to protect a raw egg from breaking upon impact is dropped from the announcer’s booth at the Westwood High gym by teacher Jon Foy. Nineteen students were successful in the Egg Drop Challenge Tuesday, March 5. “I use the egg drop as a kickoff for Science Fair month. The kids get really excited about it and the enthusiasm is palatable,” said Ross. Students cheered as the name of their classmate was called and their device dropped. While some dripped egg upon impact, other devices had to be opened to reveal whether or not the contestant had been successful. Sheets of plastic were placed on the gym floor to protect the finish. Last year, the event took place outside, with the egg devices dropped from the roof of the school. In 2018, about 20 students were successful. Each of the victorious students in 2019 received a certificate. They were Elaina Strand, Sophia LeMaster, Kyla Luna, Jaylynn Halcrow, Riet Graves, Conner Foy, Tanner Foy, Ryan Nelson, Aaden Prewitt, Trinity Kellogg, Jacelynn Haro-Ortiz, Aubrey Lutes, Emma Ortlieb, Jeris Stevens, Ryan Hedrick, Merilyn Baehler, Jaxon Hart, George Fellos and Wyatt Rentfrow. The Science Fair takes place at the end of March with entries due Monday, March 25, and the public presentation held at 6 p.m. Wednesday, March 27 in the Westwood High gym.